2)In large pan, heat up 1/4 cup oil and saute the paste for about 10 mins. Stirring every few mins. 3)Remove 3/4 of the paste and put it in large pot to make the soup. With the remaining 1/4 paste, add 1 tbsp soy sauce, 1tbsp ketchup and 1 tbsp chili sauce and some salt to taste. Mix everything together and let it saute over medium heat for 2 mins. Turn it off and let it cool. 4)Make a packet of Rice noodles and mix the cooled paste into the cooked rice noodles. Make sure rice noodle are not over cooked. Warm it up in the Microwave just before serving. 1) Add 4 cups water to the paste in the pot and bring it to boil. 2) In the mean time, add 2 tbsp brown sugar, chili powder, salt, some lemon and 1/2 cup finely ground peanuts. 3) Bring the soup to boil. Soup should be spicy with a bit of sweetness and sourness. Let it boil for about 5 mins . 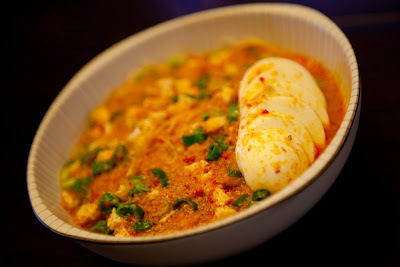 4) Put some rice noodles in a bowl, top it with some chopped green onion, tofu and sliced boiled eggs. Pour hot soup over and serve.